How to configure sending mail? In Rukovoditel assigned users are notified about new entries, new comments, etc. read more. By default option “Use email notification” is enabled and on the page “Email Options” you have the possibility to setup options for sending emails. If the function to send mail is configured on your server, then to send messages no other settings needed. But very often web servers have their own restrictions and rules for sending emails. Let’s look at them. To protect from spam mailing list, the server puts a limit at which the sender’s address should be on the basis of your domain. If this limit is enabled on your server, select the option “Send all emails from support Department Email Address” and configure “Email address from” option. 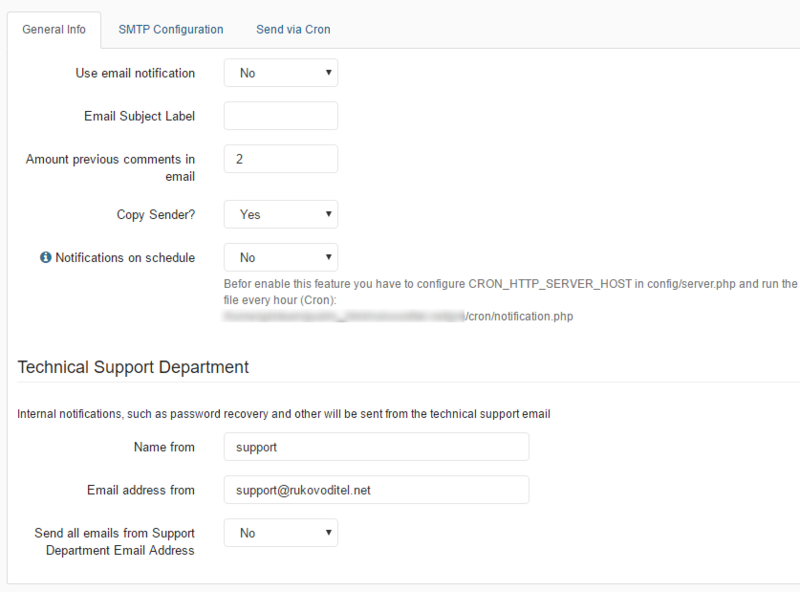 Go to your hosting control panel to get SMTP options for email address or ask hosting support. Please note: if you installed the Rukovoditel on a local server and want to send notifications, you have to use the SMTP server. Usually web servers have limitations on the number of emails sent per second, hour and day. For example, your server has a limitation of “not more than 5 emails per second”, and if you create a project and assign more than 5 people, then not all users will receive a notification. 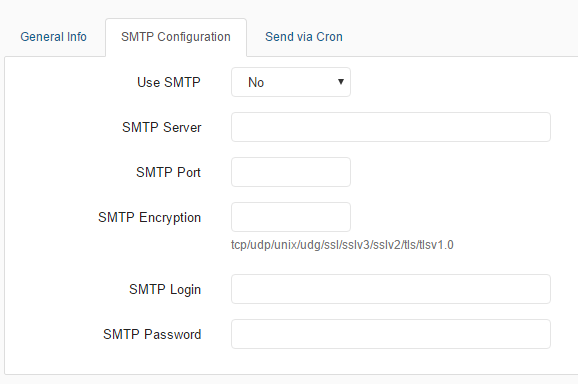 In this case, you need to set the option “Send via Cron” and configure the settings in accordance with the restrictions of your server. If all the settings are configured correctly and emails are still not coming, check your “spam” folder, maybe the emails for some reason fall into this folder. How to install Rukovoditel on a virtual hosting? How to simple install Rukovoditel on local pc? How to Increase Maximum Upload File Size? How to run a Cron Job? How to use Formulas and Functions? Open-source project management software Rukovoditel is designed to be installed on your own local server or online server with support PHP / MySQL. The peculiarity of the system is not only that it's free, but also in the fact that it allows you to design the application, the most suitable for a particular purpose.